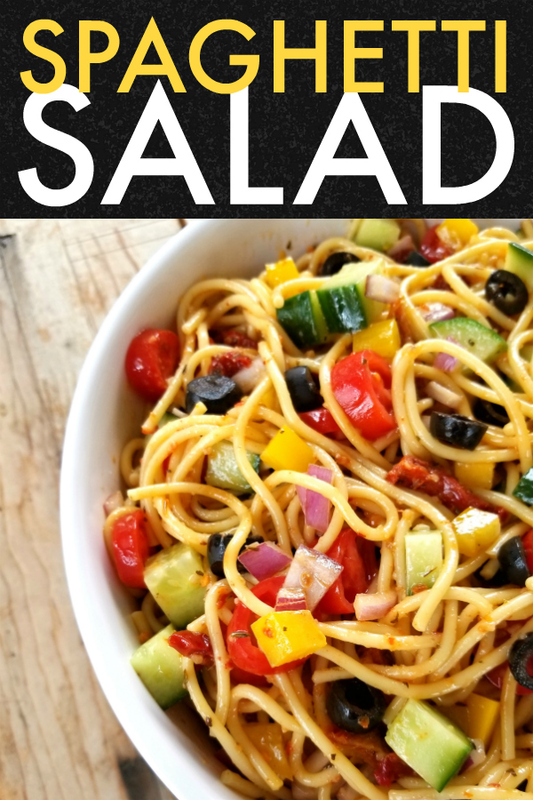 A fun, unique and beautiful pasta salad recipe made with spaghetti noodles bursting with Italian flavor and flare that will become a quick favorite because it’s so easy to prepare! Years ago I took the kids to a birthday party for my friend, Dawn’s son. Dawn loves to cook like I do so it came as no surprise that the food served at this party filled with rowdy little boys went beyond Cheetos and hot dogs. One of the things she had made was a pasta salad the likes of which I’d never seen before. It was a pasta salad made with spaghetti noodles. What the what?! I’ve since done some research to find several recipes similar to hers but until that moment, I’d never seen such a thing! 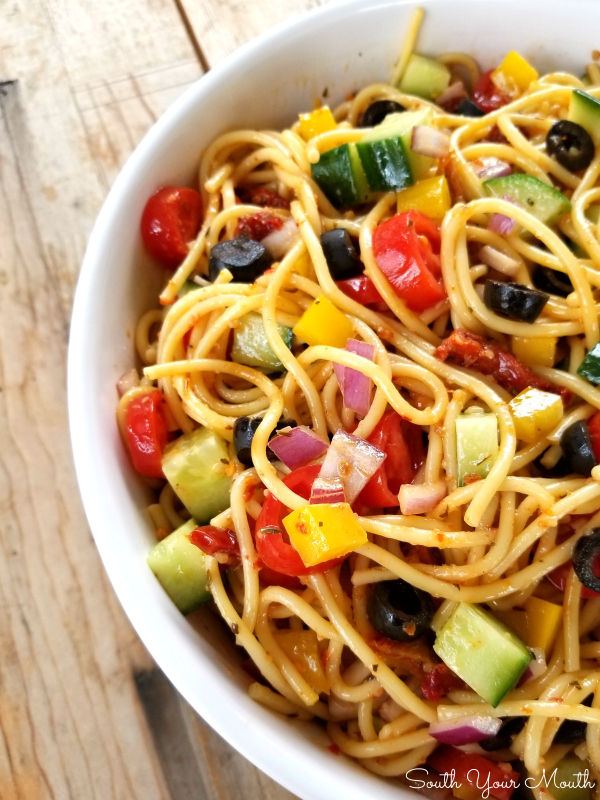 I decided to make her spaghetti salad for y’all this weekend! She sent me the recipe, I jotted down the ingredients and planned to pick everything up when I went out later in the day. And now I have to switch gears and tell y’all what happened when I went to the store. In a bizarre series of events I found myself with an hour to kill, an empty house and nothing I absolutely had to be doing. Since that almost NEVER happens, I decided to have some “me time” and fired up my tablet to watch some Netflix. I’d never watched TV on my tablet before so I thought I was so cool laying there with my own personal little TV watching my show. I watched it for a little over an hour then set out to go run my errands. I noticed that my eyes were blurry. Like how they are when you’ve been reading a while and you have to wait for them to adjust. Except they weren’t adjusting. I drove the whole way to Wal-Mart in a blur. Not like in a dangerous way, mind you. I could see people and cars but I couldn’t have read a street sign if my life depended on it. I was a tiny bit alarmed but figured it would get better over time. Well, I’m telling you all this to say to anyone I know and may have seen in Wal-Mart, I am sorry if I walked right past you and didn’t speak! I’m absolutely positive I did this to at least one person. This man stopped in his tracks and smiled at me. You know, the way you would if you ran across a friend at the store? And since I couldn’t see his face clearly enough to tell who it was, I just slapped a polite smile on my face, nodded and kept right on walking! I totally panicked! It may have been my friend Mary’s husband, Russ. It may have been my cousin Lisa’s other cousin Joe. It may have been a guy from the bar I used to hang out at 20 years ago. But, whoever you were, I am so sorry! To all my local peoples: if any of your menfolk were at the Wal-Mart Saturday, make sure they weren’t the one I was so rude to and explain what was wrong with me! It’s killing me to think I might have made someone I know feel like I didn't even recognize them or that I couldn't speak! I’ve since learned this is a common affliction of watching too much TV on an electronic device at close range. I had gadget goggles on!! Now I’m seriously concerned for my kids’ vision. This can’t be good for your eyes! OK, back to the recipe! Dawn had taken a picture of her recipe and texted it to me. It looks like maybe it’s from one of those old community cookbooks (which I dearly LOVE). 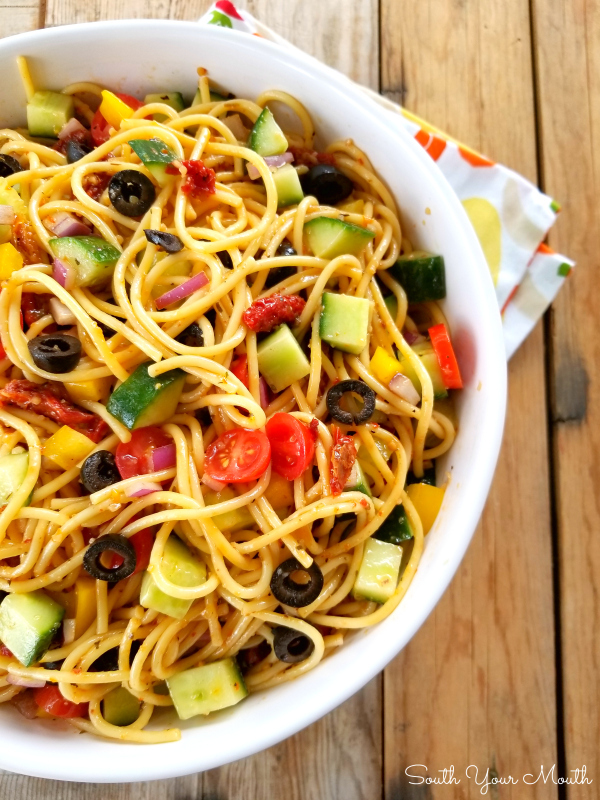 The ingredients for her recipe are: 1 pound spaghetti, 1 green pepper, 1 cucumber, 1 onion, 1 tomato, 1 bottle Italian salad dressing and 1 bottle Salad Supreme. The instructions read: Make 24 hours ahead of time. Break spaghetti into 3 inch pieces before cooking. Mix all ingredients together. Not sure what ‘Salad Supreme’ was, I searched it up online and learned that it’s a mix of stuff that’s used to enhance or dress up a salad. The ingredients are romano cheese, salt, sesame seeds, poppy seeds, celery seeds, paprika, black pepper and red pepper. Here’s where I tell you something about myself you may end up filling under “TMI” but I’ll tell you anyway… I can’t eat stuff with tiny seeds in it without wearing them all in my front teeth! I’ve got my grandmother’s teeth and they’re arranged in such a way that tiny bits LOVE to hang out and party on my grill for everybody to see! So I made an executive decision and decided not to use the seed-filled mix and instead decided to use a dry packet of Italian dressing mix for the little extra ummph. And it was glorious! 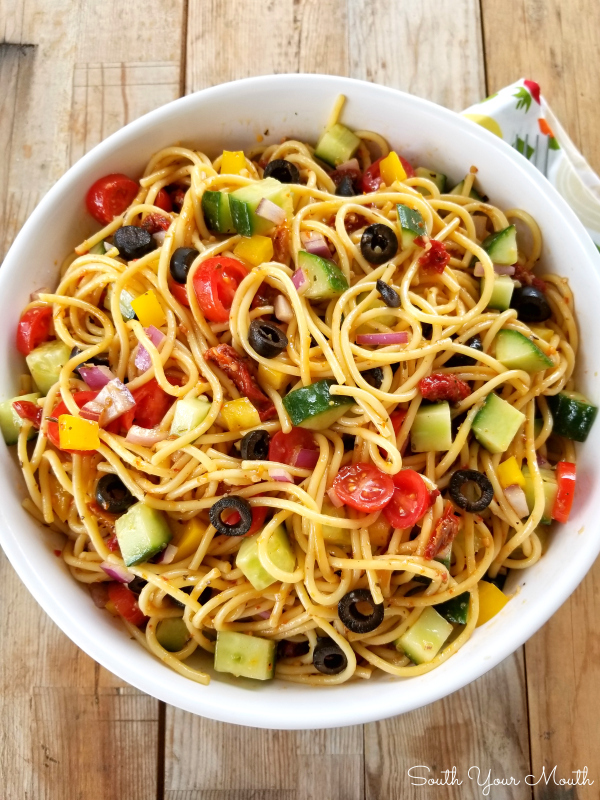 I changed a few other things too… I added sun-dried tomatoes and black olives because they just seemed like perfect ingredients to pair with spaghetti noodles! And I didn’t break the noodles into 3-inch pieces because I wanted them to be long enough to twirl on my fork. I didn’t add the fresh veggies until just before serving because I wanted them to be crisp and fresh! So, maybe this isn’t Dawn’s recipe anymore. Ha! But it’s definitely inspired by hers and just as delicious! Add whichever veggies you like (and omit any that you don’t). Don’t let the full bottle of dressing scare you off. I thought it was surely going to be too much but once it sets overnight, the pasta soaks it up and it’s perfect! Break spaghetti noodles in half (or use the pot-sized noodles) then cook in liberally salted water per manufacturer’s instructions for al dente preparation. Drain noodles well then add to a large mixing bowl. 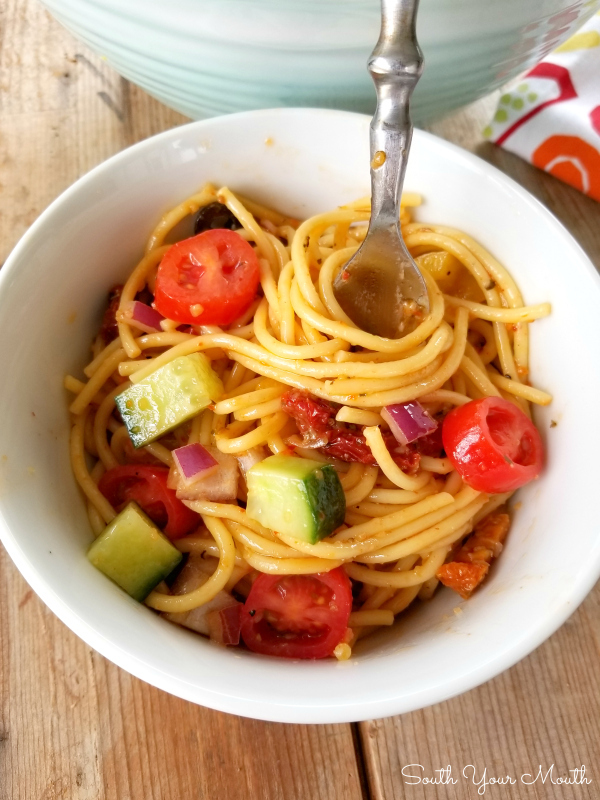 While noodles are still warm, add Italian dressing, dry Italian dressing mix and sun-dried tomatoes (see notes) then mix well. Cover and refrigerate overnight. When ready to serve, add remaining ingredients then mix well. Cover and refrigerate to store. Dice the sun-dried tomatoes before adding to the pasta if necessary. The brand I used were julienne cut and didn’t need to be cut into smaller pieces. 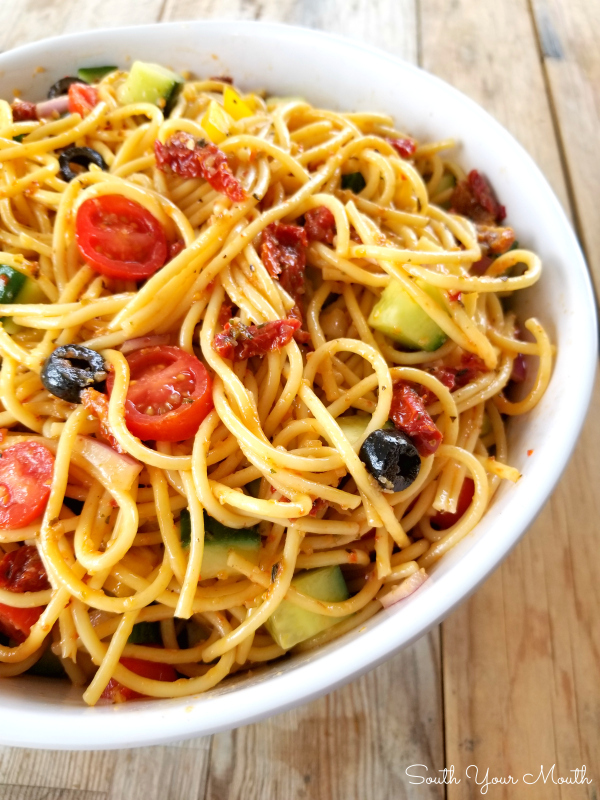 The spaghetti noodles are super fun and eye-catching but feel free to use a different type of pasta if you prefer. You don’t need to wait until the exact minute you’re about to serve this to add the fresh veggies – they’ll still be crisp for hours once you add them. I just don’t recommend letting them sit in the dressing overnight or mixing them with warm pasta. Had to giggle while reading your story of the grocery store visit. I've had that happen when I *could* see and did recognize the person, but could not --for the life of me--remember their name. How embarrassing!!!! Thanks for the recipe adaptation. I make a salad that's almost identical, and I DO use Salad Supreme. It's made by McCormick, comes in a small plastic bottle, looks sort of like chili powder in color, and is located with all the other spices in the grocery store. I hope you don't let the seed thing stop you from trying it next time. I am positive Salad Supreme will not give you any problem at all. It's really a finely ground spice. The seeds that are there are teeny tiny, and it completely changes the taste of the salad. I ALWAYS get raves when the salad is served, and I swear it's nothing special that I do. It's the Salad Supreme!! It's good to know, though, that dry dressing mix is a good substitute in a pinch. You never know when that might come in helpful. A FRIEND OF MINE MAKES THIS BUT SHE ADDS SHRIMP HAM AND THE GREEN OLIVES TO IT IS SOOOOO GOOD! This is similar to how I make it, except I add cut up pepperoni, diced up swiss cheese and cheddar cheese, fresh sliced mushrooms, celery. Loved your story of your trip to the store. So, I read this after I got finished clearing the snow off my drive and wishing summer would hurry up. This salad is not a January meal, at least where I live in Virginia, but it sure is a summer dish. Saving it for then. Looks fantastic. This salad definitely sounds delish, and I can see why you loved it. I have an event coming up, to which I was asked to bring a pasta salad. I will use this as a base recipe with the following changes: Wish Bone Robusto Italian salad dressing, and dice in some ham and Monterey Jack cheese. BTW, many bloggers have a "Jump To The Recipe" option, which eliminates a l.......ng scroll, in order to view the actual recipe. (Just sayin'). Looks good. I have a similar recipe for the same salad. However, in the dead of winter and with temps well below freezing (-17°) I think I'll hold off on this recipe for now. However, I am making the sliders (Mone Cristo Party Sliders) for the superbowl event. Thanks for the recipe. This looks perfect for a summer bbq! I had never heard of salad supreme either, you learn something new every day! this pasta look delicious! Plus the ingredients make it a healthier version compared to most pasta recipe. Can't wait to try it out!